Former Sen. Jim DeMint (R-S.C.) on Monday night urged voters to replace any Republican lawmaker unwilling to vote to defund ObamaCare during next month’s budget showdown. DeMint, the president of the Heritage Foundation, dismissed fears that Republicans would be blamed for a government shutdown, as they were in the 1990s. 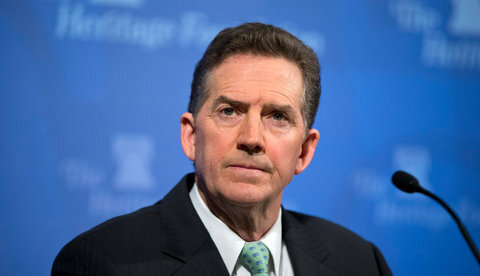 “The risk of that is so much less than the risk to our country if we implement ObamaCare, and so I’m not as interested in the political futures of folks who think they might lose a showdown with the president,” DeMint said at a town-hall meeting hosted by Heritage Action, the think tank’s political arm, in Fayetteville, Ark., the first stop on a nine-city tour. DeMint said President Obama believes he has the upper hand in the coming fight.